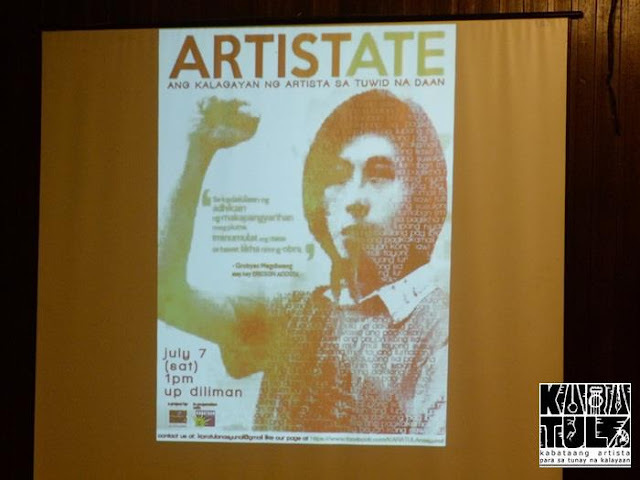 is a comprehensive forum on the current state of artist under the Aquino regime. The Filipino public and artist community was faced with numerous issues of repression and scrutiny these past couple of years. It is important to have a fresh and integrated look into the prospects of artistic development. Dance Pinoy supports KARATULA (Kabataang Artista para sa Tunay na Kalayaan) in its pursuit to promote Philippine Arts and Culture on a National level. Last July 7, 2012 students, representative from organizations, veteran artists and art scholars gathered at the College of Mass Communication auditorium of UP Diliman to discuss about the state of arts in the Philippines. "Sa Kadakilaan ng adhikain ng makapangyarihan mong pluma, iminumulat ang masa sa bawat likha nitong obra". - Grobyes Magdiwang alay kay Ericson Acosta. A group of UP students sang a few songs written by Ericson Acosta, whose sense of responsibility as Iskolar ng Bayan has led him to work in the grassroots and create art with the people. 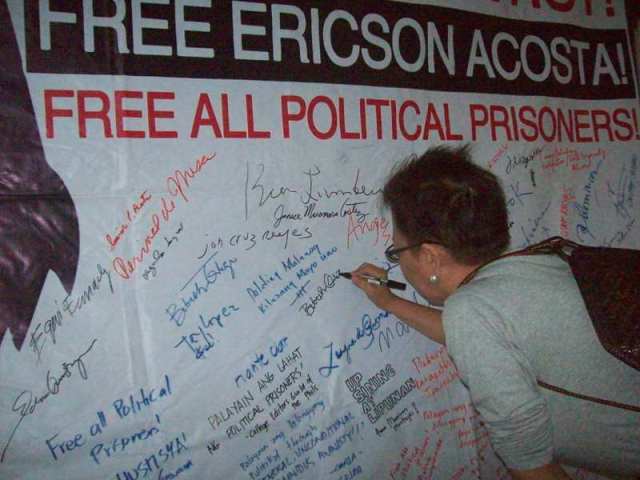 Even in detention, Ericson continues to craft poetry and songs, highlighting the plight of political prisoners in the country. There are more than 300 political prisoners unjustly detained by the Philippine government today. This was also one of the things discussed during the forum, as an introduction to the singers who sang Ericson Acosta's songs. One pressing issue discussed in this forum is K+12. The Department of Education’s K+12 is the newest education policy of President Aquino. In this program, all 5-year old Filipinos are required to enter kindergarten before entering Grade 1 and an additional two-year Senior High School will be added to the present curriculum of Elementary and Secondary education. In the new curriculum, technical and vocational subjects will be introduced to the students such as welding and machine operation so that high school graduates can be more employable. KARATULA reaches out to students to oppose to this additional year, additional expense for the common tao. During the start of the forum, KARATULA staff urged the audience to sign for the petition against K+12. Kabataang Artista para sa Tunay na Kalayaan (KARATULA), is a cultural organization of youth artists, musicians, writers and cultural workers that has chapters in different communities and universities such as UP Diliman, UP Manila, UP Los Banos, UP Baguio, UP Visayas, UP Mindanao, De La Salle University and University of the East among others with the objective of creating art as a medium for progressive expressions of social change, genuine freedom and national democracy. KARATULA continues the progressive and patriotic spirit of Jose Rizal, Juan Luna, Andres Bonifacio, Lino Brocka and other artists in creating art that is responsive to the “signs” (literal meaning of “karatula” in Filipino) of the times; art that is accessible to a broader audience through alternative venues such as classrooms, schools, the streets, picket lines, slum areas, peasant and indigenous communities; art that depicts the life and struggles of the underprivileged; art that advocates collective participation in solidarity with various sectors of society.